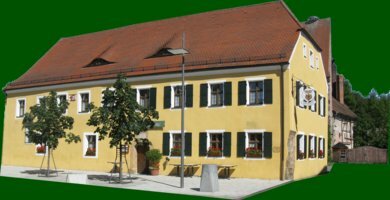 The Schloss Hotel Hirschau is a popular hotel for Hirschau Business and leisure travelers. But by traveling guests on the way to the Czech Republic may come in. On these pages we provide information about our company and the environment, or booking and contact information. Our hotel in the city center offers 12 comfortably furnished rooms, 2 restaurants, and in summer sunny terrace and a beer garden. Hirschau is a small town in Northern Bavaria with about 6000 inhabitants. The town is known by its kaolin industry and the resulting over 100 meters high "Monte Kaolino". At this heaped mountain, skiers and Snowboarders also operate in summer hobby. also provide an alpine slide, a high ropes course and constantly more Attractions leisure activities for everyone. Away from Monte Kaolino offer but also for anglers Riders, cyclists and walkers plenty of opportunities. Or use the site but simply as a starting point for exploring the surrounding area or the nearby Czech Republic.